3 + = 10 Required Please enter the correct value. With six new IPOs this week expected to raise a combined $556 million, it's safe to say the 2016 IPO market has fully recovered. 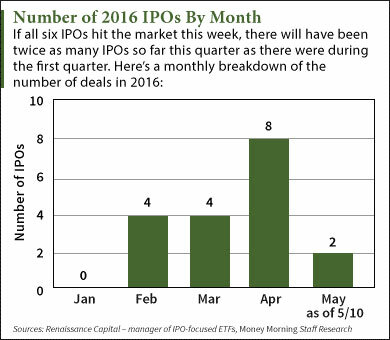 You see, there was a low volume of 2016 IPOs prior to this week due to volatility in the broader markets. The Dow Jones Industrial Average and S&P 500 dropped 4.5% and 5.5% during the first two months of the year, respectively. That caused many IPOs to delay their launches. Only four companies went public over that same period. But April saw a surge in IPO activity that included MGM Growth Properties LLC's (NYSE: MGP) massive $1.1 billion debut. That was the biggest IPO of 2016 and the largest deal since First Data Corp. (NYSE: FDC) raised $2.6 billion in October 2015. SiteOne Landscape is the largest distributor of landscaping tools and supplies in the United States. A spin-off of Deere & Co. (NYSE: DE), SiteOne boasts 477 locations and sells irrigation units, fertilizers, and other supplies for residential and commercial use. The company posted sales of $1.5 billion last year. It plans to raise $210 million by offering 10 million shares at a price range of $20 to $22 each. The firm commands an $863 million valuation and will start trading on Thursday, May 12. Acacia Communications Inc. (Nasdaq: ACIA) provides high-speed modules that connect data centers. The startup mainly sells optical cables to cloud service providers for the purpose of quickly processing network traffic. Acacia earned $239 million in sales last year and is one of the few startups that's turned a profit before going public. The company benefits from its biggest customer ZTE Corp. – one of the largest independently owned telecom firms in China. Acacia is set for a $99 million deal by selling 4.5 million shares at a $21 to $23 price range. The company is valued at $889 million and will hit the market on Friday, May 13. Viamet Pharmaceuticals Holdings LLC (Nasdaq: VMET) is a biotech firm developing treatments for fungal diseases and infections. The company's lead drug candidate will treat common nail fungus, which affects an annual average of the 32 million people in the United States. Viamet is backed by Novartis AG (NYSE ADR: NVS), the third-largest drug company in the world. It will generate $86 million by offering 5.7 million shares at a price range of $14 to $16 each. The firm commands a $389 million valuation and will debut on Thursday, May 12. Turning Point Brands Inc. (NYSE: TPB) sells tobacco products, including Zig-Zag rolling papers, cigar wraps, and chewing tobacco. The firm is profitable and posted $200 million in sales last year. However, Turning Point's annual sales fell by 2% in 2015 due to declining sales across the broader tobacco industry. The company will raise $76 million by selling 5.4 million shares for $13 to $15 each. It's valued at $278 million and will start trading on Wednesday, May 11. Oncobiologics Inc. (Nasdaq: ONS) is set for a $60 million deal by offering 5 million shares at a price range of $11 to $13. The biotech has not announced an official IPO date but is expected to hit the market sometime this week. Cancer Prevention Pharmaceuticals Inc. (NYSEMKT: CPP) will raise $25 million by offering 1.92 million shares at a $12 to $14 price range. The cancer biotech will debut on Wednesday, May 11. Alex McGuire writes about IPOs for Money Morning. Follow him on Twitter for updates on IPOs this week.